Certainly that’s not right. The direction is supposed to be west, is it not? 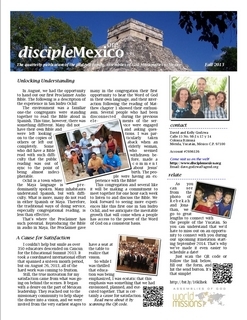 Well, if you live in Merida, and your goal is ministry among the Maya, then east is the direction you want to travel. And go east we did, Joseph and I that is, to be a part of another Action Group training for the Jesus Film in Maya. We travelled three hours on a rather circuitous route to make it to the city of Tizimin, where one of my former students, Alex Canul, served as our host. 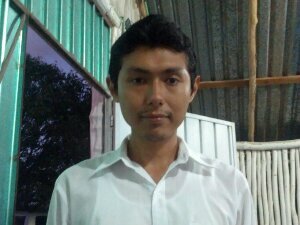 Once there, churches from Tizimin, Espita, and Dzonot Carretero, five in all, were trained with the view to participate in a Jesus Film outreach in their area. Of course, the goal of the Jesus Film is much more than simply the projection of the film itself. The goal is to leave a nucleus of believers, a functioning church, in each place it is shown. 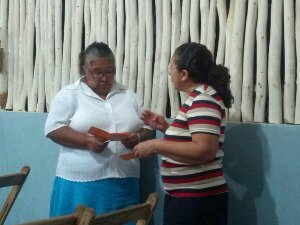 To do so, Action Groups are trained in everything from personal evangelism and testifying to teaching discipleship classes to new believers. Our time in Tizimin was a full day of teaching strategy, methods, and techniques, but we took time as well to emphasize our dependence on the work of the Holy Spirit to create opportunities, to open doors, and to work in the hearts of those reached by the film. 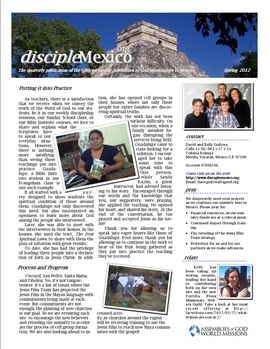 We left satisfied with the ground that we were able to cover, but more desperate than ever for God to reach Maya speakers in the Yucatán with a clear presentation of the story of Jesus and a church home full of the sound of their native language. Evangelism is important to me. 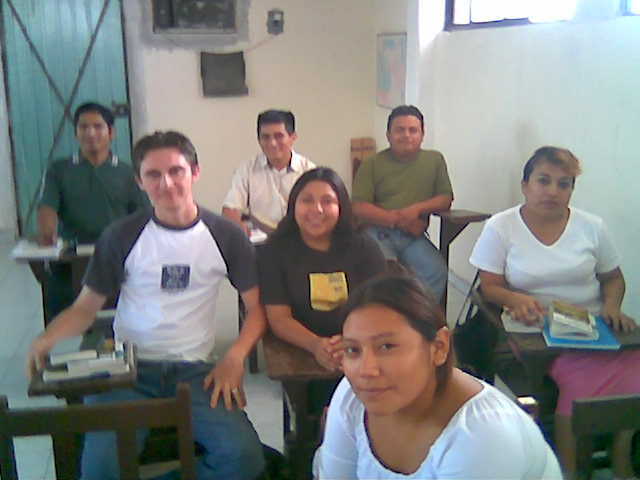 Since 2006, it’s been one of the principle classes that I’ve taught at the Bible School. So, for me, evangelistically related themes take on a special interest. This past month, as I wrapped up my Missions class, I discovered some interesting information about world evangelism. First of all, the need is immense. The Joshua Project, a site which reports the state of the gospel among unreached people groups, declares that 2 out of every 5 people do not have an adequate witness of the gospel. Nevertheless, Evangelical Christianity has never been so prevalent as it is today. 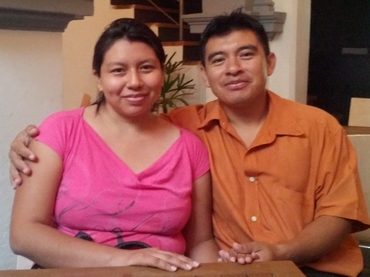 According to Ryun Chan, author of the “Manual de Misiones”, at our current numbers, there is one evangelical believer for every nine non-believers in the world. What does this mean? It means that although the task is great, if each of us does his or her part, the goal of finishing the Great Commission is within reach. Still, with the promotion of tolerance as the most prized virtue, pressure is mounting for us to keep our faith to ourselves. In other words, if the trends continue, we may be experiencing the high water mark of Evangelical Christianity even as our goal is within reach. How do we combat these trends? Only by keeping our stated purpose in focus. Our denomination, the Assemblies of God, in its statement of faith has declared that “the Church has a Mission to seek and save all who are lost in sin.” It is therefore an imperative to engage in and promote evangelism, and that is just what we’re doing here in Merida. On November 13th, I began teaching a new generation of Bible Institute students in my sixth installment of “Evangelismo Práctico I.” This new group of eight students are walking through a set of lessons and assignments to help them make evangelism, not just a task but a way of life. Already, we’re seeing fruit as these students are putting themselves in contact with seekers. Stay tuned for updates as we continue through the semester! There is a certain satisfaction that we receive from teaching God’s Word, but it’s even more gratifying to see it put into practice. Let us share with you how that’s happening! Click here or on the picture to read our latest update! 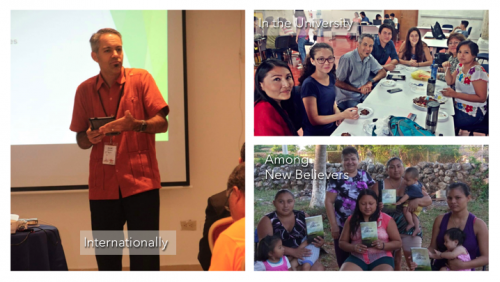 I’ll be traveling to Florida next week in order to attend an ACLAME summit where teachers across Latin America will be meeting to discuss what we do as missionary educators. This upcoming convention has given me pause for thought about my own experience some of which I’d like to share with you today. 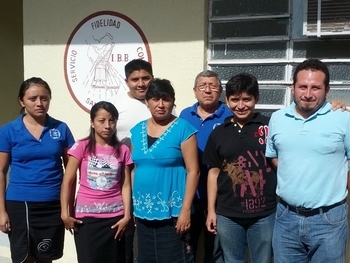 As I’ve been here in Mérida, I’ve had the privilege of teaching for a year and a half in the Bible Institute. This is a job that I have met with much fear and feeling of responsibility. As James says, “Not many of you should presume toJ be teachers, my brothers, because you know that we who teach will be judged more strictly.” I understood the need to prepare myself mentally and spiritually for the task before me, something that my family could attest as they frequently find me in my “cave” praying and writing, trying to sort out what I am to share with my classes. Nevertheless, as I become more aware of the environment that I find myself in, I have found something that I was not prepared for. I entered into the learning environment with expectation. I was under the impression that the students that I would be teaching would be looking for answers, trying to hone their skills in order to seek the gospel take root in otherwise fruitless ground. I expected students to challenge me with their questions and compel me to further study as we sought to practically apply the theology that we assimilated each day, and in some cases, this is what I have found. But as I look over the half-finished assignments and the failing grades of others, I’ve faced a different reality, one that is in stark contrast with my expectations. So I’m left with the task of answering the question, “what am I doing wrong?” Bruce Wilkinson, a teacher associated with Walk Thru The Bible Bible Ministries, says that motivating his or her students to learn is the task of the teacher. Therefore, if I am to be brutally honest with myself, and if I am to take James’ admonition at face value, then I need to reevaluate my teaching style and find out how I can reach those who fail to excel in their studies. The Bible College system in Latin America accepts all students who feel called to the ministry regardless of their educational background. They need only letter of recommendation from their pastor in order to gain entrance into the program. This means that many of those who study lack the essential tools that they need in order to complete the requirements of the classes that they enter. I have found that the majority of students have never written a paper or done an investigation. One of my students admitted to me that her studies only reached as far as the fourth grade! What does this mean? First, it seems to imply that education, according to my interpretation as the exchange and analysis of ideas is not necessarily the goal of my students. Instead, they are looking for intensely practical and readily applicable methods that they can use now in their context. They are not interested in asking questions; they are looking for answers. Therefore, my task as professor requires me to meet the expectations of my students by providing them answers while at the same time builds the tools that they need to make learning a lifestyle. I find myself taking the role of a Mr Miyagi of the Karate Kid. Daniel, his student, wanted to learn to fight, but Mr Miyagi only left him to menial tasks like painting the fence and sanding the floor. Only when Daniel blocks a series of kicks and punches with techniques that he had learned by painting and sanding does he come to understand and appreciate Mr Miyagi’s style. So I’m restructuring my teaching style. Instead of driving ahead in order to complete the material, I am finding myself teaching concepts of research and reasoning, helping students formulate good questions for interviews, and locating good resources in the library. I’m breaking concepts down and trying to reinforce small steps toward large goals, all the while seeking to illustrate how the job of the minister makes the learning of each tool we cover essential. On one hand, I lament not being able to get to “the meat” of the course, but at the same time, I realize that formal education, if it is honest with itself, must admit that it cannot impart all knowledge. I have only 3 years with a Bible School student. That is an incredibly short amount of time to communicate knowledge. Furthermore, I have to admit that I have forgotten far more that I have internalized over my 8 years of higher education. However, if I seek to impart the tools necessary to study, and convey an attitude that promotes learning, I can create a lifetime learner, an investigator who seeks to find the answer and apply truth in such a way as to create change. I guess that you could say that my goal is to create someone like the Karate Kid, who will find they have what it takes to survive and thrive in a world increasingly hostile to the traditional Christian message. I appreciate your prayers as I attempt to make this happen. I have to go right now though. There is a fly buzzing and I need to find my chopsticks.